← DECADENCE!!! 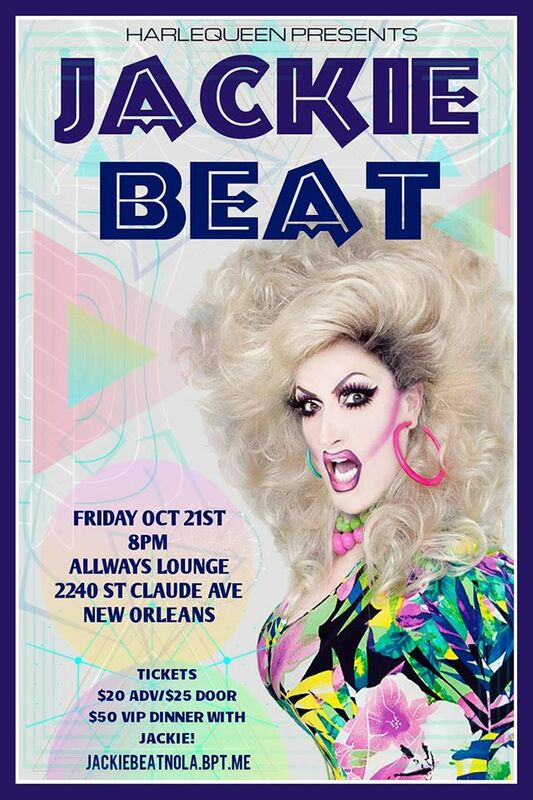 boylesque…bingo…dirtydime peepshow w/ Violet Chachki…PooPoo Platter…Come get down in New Orleans favorite cabaret! Drag superstar JACKIE BEAT has been entertaining audiences across the U.S. and in Europe for over TWENTY-FIVE YEARS with her razor-sharp comedy and hysterical song parodies. Jackie not only warps hits by Britney Spears, Madonna, Mary J. Blige, Christina Aguilera, Cher, Lady Gaga, Katy Perry, Mariah Carey and many others, but she flawlessly sings her twisted new versions LIVE hitting every last note.